Steeped in nature, tradition and heritage, McGuire’s Cottages are welcoming holiday accommodation havens with their own story to tell. Owned by Sinead and Pascal Gillard, the cottages have individual personalised names which add to their wonderful sense of character. 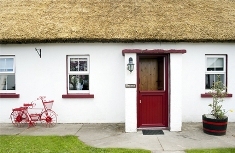 McGuire’s Cottages, a complex of eight cottages was built by Sinead’s grandfather in the late seventies with each cottage being named after his eight grandchildren. At the time, McGuire’s was one of the first ever self-catering accommodation businesses set up in Ireland and it is now one of the most popular in Co. Leitrim -attracting visitors from Ireland, UK, Germany,France Switzerland, Belgium, Holland, United States and Australia who come to de-stress, fish and enjoy the relaxed pace of rural life here. French and German are spoken fluently at McGuire’s Cottages. One cottage has been transformed into an on-site restaurant and a commercial production kitchen for Jinny’s Bakery, a multi award winning business. These self catering cottages overlook the picturesque Acres Lake, approximately one km from the village of Drumshanbo in Leitrim, the North West of Ireland. There are seven cottages; four which sleep six people and three which sleep four people. These detached, traditional style cottages all come with a historic half-door, open-hearth fire and flag-stone floor. In contrast to this taste of the past, each also has all the modern conveniences of present-day living. Other facilities on site include a fisherman’s bait rooms and artisan bakery. With our family residence adjacent to the cottages we are always ready to meet your daily needs. Plan your trip to McGuires Cottages today! Character charm and contentment await…. Extras Include: Gas & Electricity which are metered and payable at the end of the stay. Your family break at McGuire’s Cottages promises to be fun filled and action packed with a huge selection of exciting indoor and outdoor activities available in the area for families and groups of all ages. • Outdoor Adventure – Lough Allen Adventure offer hillwalking, kayaking, canoeing, windsurfing and archery. Also available are summer camps and survival skills training. Lough Key Activity Centreand Zipit Forest Adventures also located nearby. • The Marble Arch Caves – one of Europe’s finest show caves allows visitors to explore a fascinating, natural underworld of rivers, waterfalls, winding passages and lofty chambers. • Knock Airport. 52 miles (1 hour 5 mins).